Marinated chicken cooked with dry red curry paste, thai herbs & lime leaves, then served with crispy basil & cucumber sauce. Prawns wok-tossed with fresh herbs, snap pea, zucchini, cashew nut and our chilli jam sauce topped with crispy basil leaves. 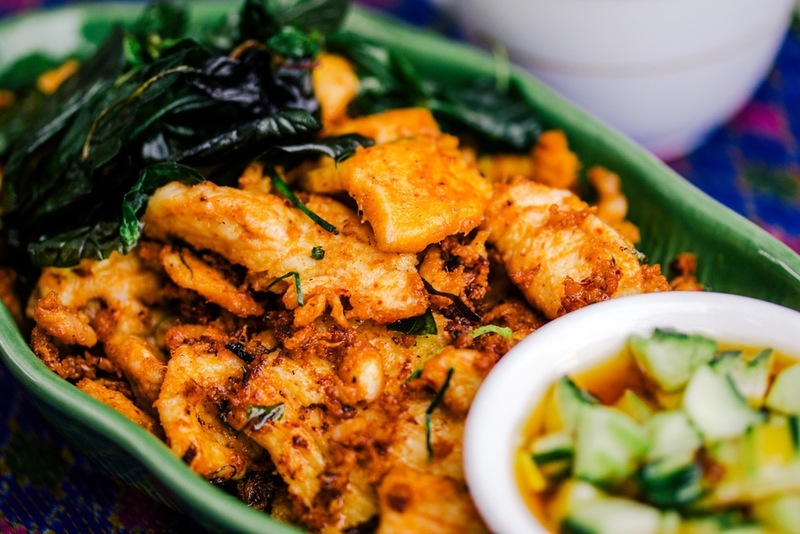 Fried fish fillet sliced and served with a tangy combination of lemongrass, onion, carrots, garlic, roasted ground rice, mint leaves, coriander, fish sauce, chill and lemon juice. Crispy prawns in homemade mild sweet and tangy chilli sauce topped with crispy basil leave. Boneless duck marinated in our chef’s secret sauce, deep - fried to a golden brown & served with a sweet plum sauce. Roasted duck maryland sliced smothered in a zesty tamarind sauce, topped with crispy fried shallots. Chicken pieces marinated with our curry powder mix then shallow fried. Served on baby spinach leaves, drizzled with delicious homemade peanut sauce then topped with cashew nut. Boneless chicken wing, stuffed with glass noodles, chicken & green onions. Four marinated strips of chicken grilled with coconut milk & served with a delicious peanut sauce. Our most popular entree trio - two golden cups, a curry puff and an angel’s wing. Six baby spring rolls gently stuffed with glass noodle & fresh vegetables.